As one of the original 13 colonies and a home to several popular port towns, Rhode Island has a share of 17th and 18th century history. Tour around the state and find buildings that witnessed the Revolutionary War, colonists, and even pirates! Here are our 10 favorite historical sites in the Ocean State. Built in 1699, this meetinghouse is Rhode Island’s oldest house of worship still standing today. Take a tour of this historical house founded by the Quakers, who dominated politics in Rhode Island during the 17th and 18th centuries. 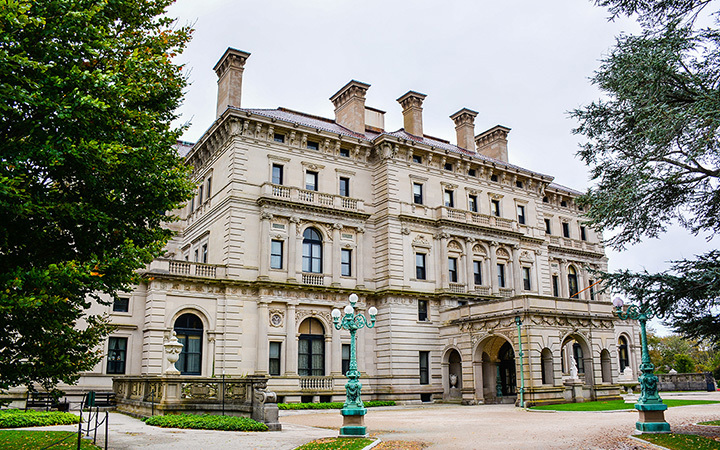 The Breakers was once used by the Vanderbilt family as their “summer cottage,” if you can call it that! As a national landmark, you can now visit this magnificent home designed by architect Richard Morris Hunt. It boasts over 70 rooms and 125,339 square feet of space. This historically-significant textile mill is known as one of the birthplaces of the industrial revolution. It was built in 1793 and revolutionized cotton procession and water-powered machinery. It’s now a beautiful location for events, in addition to tours. Designed in the neoclassical style, the State House of Rhode Island was constructed from 1895 to 1904 and is on the National Register of Historical Places. It was also one of the first public places to use electricity. Enter these fine falls and stand under one of the largest self-supporting marble domes in the world, too. Every corner of this former church is covered with beautiful frescos. The paintings were executed by Italian painter Guido Nincheri, a petite hunchback who used community members as models for the figures present in the paintings. This tiny two and a half story home with a wood structure is initially unassuming, but it was declared a National Historical Landmark in 1972. The home was built in 1770 and endured the Revolutionary War. Located near the campus of Brown University, this home was the first mansion constructed in Providence. The former homeowner, John Brown, was one of the early donors to the university, but it is well known that he was a slave trader, leading to a complicated history that the university has had to confront. This landmark Providence library was founded in 1836 and has hosted writers like Walt Whitman, Edgar Allen Poe, and H.P. Lovecraft. Ask the librarians for stories about what secrets these storied stacks hold. Take a tour of the home of this former governor of Rhode Island, who was also a signatory of the Declaration of Independence. His 1707 home acts as a microcosm of 18th century society at the time, with slave chambers, heirlooms, and completely modernized interiors. The White Horse Tavern opened in 1673, making it America’s oldest tavern. It was frequented by colonists, British soldiers, and sometimes pirates, too! It’s still up and running, and you can grab a pint there yourself, too. View more Rhode Island Historical Sites.